This week in Inside PR, Martin Waxman and I talk about the changing media landscape. This follows on recent changes to both the digital and traditional paper versions of the New York Times, Globe and Mail and Toronto Star. We also have an audio comment on the power of Twitter to connect communities of interest from Jody Koehler, founder of Coopr PR in the Netherlands. Also, if you haven’t seen it yet, check out the video of Jeff Jarvis‘ presentation in Frankfurt about creating publics. There’s a lot to think about in what Jeff is suggesting. You can listen to the complete podcast by clicking on the player here. Finally, please remember that we produce this podcast as a way of connecting with out community of interest. You can reach us many ways – through a comment on this post or on the Inside PR blog, by leaving a video comment on our new Inside PR Podcast Facebook Group or by tweeting to @Inside_PR. We’d love to hear from you. 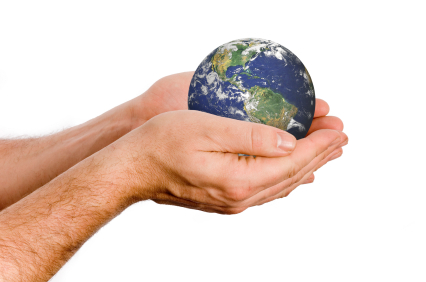 Blogging brought the world together. Twitter is pushing us apart. When I first started blogging, I was struck by how quickly and easily I discovered bloggers around the world who shared my interests and from who I could learn. My community of interest spanned the globe, including people like Neville Hobson (in Amsterdam and later the U.K.), Darren Barefoot (at that time on a one year sojourn in Malta, now in Victoria B.C. ), Allan Jenkins (Copenhagen), Katie Paine (New England), Josh Hallett (Florida), Shel Israel (California), the other Shel, Shel Holtz (California), Jeremiah Owyang, Lorelle VanFossen (Pacific northwest) and even and Lee Hopkins (Australia). Blogging had enabled me to form a community with others who shared my interests – a community that transcended time zones and geography. Over the past two years, Twitter has taken up an increasing amount of my intention. Its 140 character micro bursts of ideas, links, emotions and idle musings bring me into instant contact with the people in my community. I drop in and out of the flow several times a day. But at the same time that Twitter has given me the ability to connect constantly and quickly wiht the people in my community, it also has led to a shrinking of that community. Yes, it transcends geography. I regularly tweet to people in other countries and in Europe. 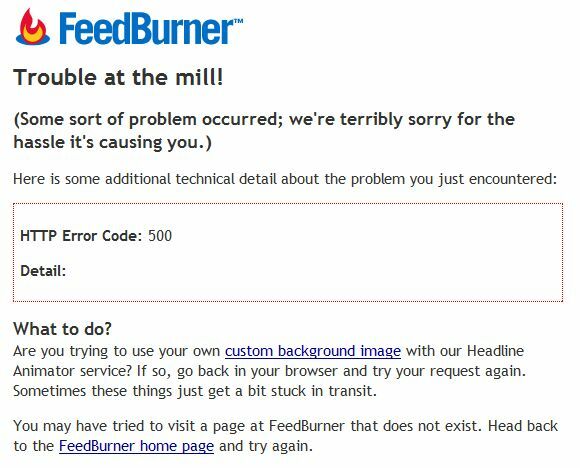 But at the same time, it has restricted my community to people within a band of time when we are all on the network live. In other words, I’ve lost sight of that part of the world in which our business days don’t overlap. In effect, my world through the lense of Twitter has shrunk to encompass only those people who are online at the same time as me. So, I’ve lost sight of those people whose workdays and online times don’t overlap with mine. They are invisible to me and I too am invisible to them. So, Twitter is a good news / bad news story for social networking and its ability to expose us to different points of view and draw us closer together. In a way, Twitter has narrowed my horizons while making my experience with the smaller community richer. Have you experienced this “invisibility effect”, losing track of people you previously experienced regularly? if so, what are you doing about it? I’ve been using Twitter more and more over the past year. Especially at conferences like those run by the Advanced Learning Institute, Canadian Institute, and OpenDialogue, as well as Third Tuesday Toronto and Third Tuesday Ottawa. I’ve replaced live blogging with live tweeting. It’s very satisfying – connecting me directly with other attendees and people who care about the same subject. The more I’ve put into Twitter, the more I’ve received back. At the same time, the number of people following me has increased. And the pace at which new followers are added has increased. I set up my Twitter profile to notify me via Gmail of each new follower. When someone follows me, I visit their Twitter profile to see if they share my interests. I follow people who write about things that interest me or who have blogs in their profiles or stand out in some other way. As I’ve done this review, I’ve found myself following about 1 in 4 of the people who follow me. Why don’t I follow more people? Recently, the pace at which my new Twitter followers has been increasing has been greater than my ability to check out everyone’s profile. (I realized this when the number of my pending Gmail emails exceeded 900!) So, I’ve settled on a new way to decide who to follow. Instead of visiting every follower’s profile (which at the rate of 20 -30 new followers a day takes over an hour), I’ve decided to watch for new people who either retweet one of my tweets or respond to me with an @thornley. I’m doing this in the belief that these people who actively engage with my content are more interested in me. And these are the people who I should be checking out and probably following. What do you think? Is this a reasonable strategy for identifying people to follow in Twitter? What approach do you use? 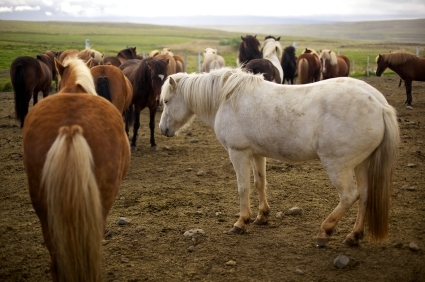 UPDATE: Jay Goldman offered some great advice on how he decides who to follow in Twitter. I missed this in my Google Search. Sorry Jay. Kelly Rusk also had a post about what she looks for when deciding who to follow on Twitter. 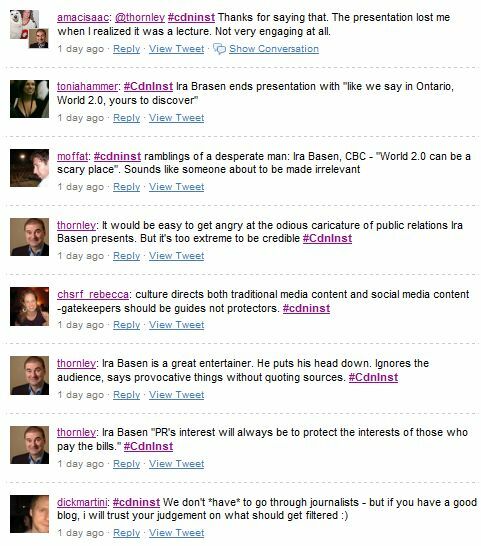 Ira Basen objects to the way I covered his presentation last week in Toronto to the Canadian Institute Conference on Social Media. Ira is a smart, respected senior producer who has had a distinguished career at the Canadian Broadcasting Corporation. He is also a highly opinionated person who knows how to use the pen and the editing room to make his points in a way that causes people to sit up and take notice. He does this by adopting a distinct point of view. He also is unafraid to make broad declarative statements that make a strong point. Most recently, he attracted attention and sparked debate with his six part radio series, Spin Cycle. I guess it’s fashionable these days to slag speakers online while they are still on the podium. Why wait until after they are finished so you might have an opportunity to actually reflect on what they had to say? This way, you can impress your friends by how clever you are, as opposed to how insightful. And besides, who has time for reflection in this busy world? I don’t think of myself as someone who slags people. Nor do I tweet “to impress my friends.” My hope is that I can provide people with information and a chance to know what is being said at events they aren’t able to attend. And along the way, it gives me a chance to test my perceptions against those of others in real time. I wasn’t alone in disagreeing with Ira Basen’s approach. On the other hand, some found value in what he said. And that, to my way of thinking, demonstrates the value of Twittering during a presentation. We can profit from other people’s thoughts in real time, deepening our understanding and providing validation or challenge for different perspectives. 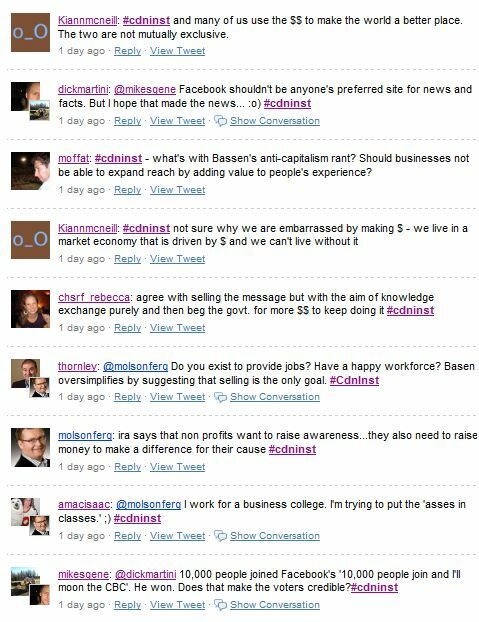 So, to be fair, I’ve decided to post the original twitter stream, Basen’s email to me, my response to him and his further response. I’ve also offered to post the complete script of his presentation if he will provide it to me so that we can all have firsthand knowledge of what he said. In the absence of this, I think the Twitter stream provides insight into what different people culled from his remarks and the discussion that took place. Once you’ve had a chance to read this, please tell us what you think? What are the real issues here and where do you come down on them? Remember, this is Twitter. So, if you read top to bottom, you are reading in reverse chronological order. I have edited the stream to capture only the tweets directly relevant to Ira’s presentation. There were some other side conversations interspersed with these tweets. 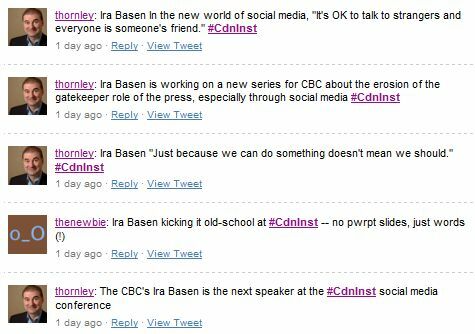 I’ve removed these tweets to make the conversation regarding Ira Basen’s presentation easier to follow. 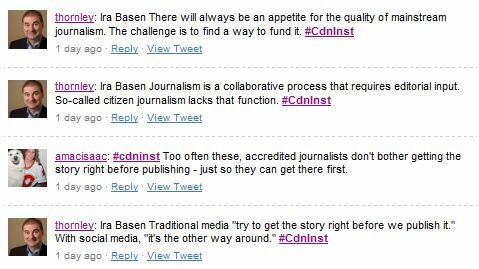 You can find the complete conversation by entering “CdnInst” into Twitter Search. And maybe it is also considered unfashionable to respond to being twittered, and to do so using more than 140 characters, but as I probably demonstrated the other day, I’m an old fashioned guy. I assure you that I do not regularly follow your twitters, but a friend was kind enough to send along your remarks about my presentation, and I must say, I was disappointed. I expected better from someone who is widely considered a leading light in Canadian PR. In the five years that I have been writing and speaking to and about the PR industry, I have observed that there are basically two sets of responses to my work. The first group considers me to someone who needs to be closely watched, and makes the assumption that as a journalist, particularly a CBC journalist, writing about PR, I must be both negative and wrong-headed. I find this to be an almost reflexive response since those people often don’t seem to listen very closely to what I’m actually saying. The second response is that I might have valuable questions to raise, and so I might possibly be worth listening to. I do it because I think entering into a dialogue like the one we had on Wednesday is useful for everyone. For some reason, you mock the fact that people were actively engaged in that discussion. “Is that a good thing?” you wonder after observing that I got people talking. I find that to be an incredible question for someone of your stature to ask. Frankly, I think you should be embarrassed that you even raised it. Why would you minimize the importance of that dialogue? My point, in case you missed it, was that we need to think about the implications of the road we are going down in social media. I raised issues that I think journalists need to think about as we embrace “citizen journalism”, and issues raised by PR’s entry into a world of social media where the gatekeeper function has been diminished. If you don’t think those questions are worth discussing, you should have invited one of the many social media kool-aid drinkers on the circuit, rather than me. My sense was that people in that room wanted to engage in that debate, even if you did not. By the way, after reading your comments on Twitter, I was surprised that you did not raise your objections at the time, or come up and speak to me afterwards. I guess that is old fashioned as well. 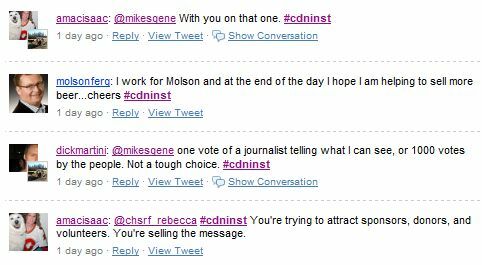 You made several comments about my exchange with the representatives from Molsons. Surely you must know that the points I was raising were raised first, and with much greater vigour, within the PR community when that “blogger relations” event took place last July. In case you missed it, here’s a place you can start….. I had been hoping to attend the Molsons presentation on the first day of the conference, but I wasn’t able to make it. I assume that the objections raised by Heather Yaxley, Judy Gombita and other PR practitioners about that event were discussed in that session. If they weren’t, I’m glad I was able to raise them, because I think they are rather important. I would hope you do to, but I must say, after reading your comments, I rather doubt it. You should also know that I take all of these invitations to speak to PR groups very seriously. If my perspective on PR is as misguided and distorted as you seem to think it is, if all I do is propagate “simplistic and misleading stereotypes”, why do I keep getting asked back to speak? 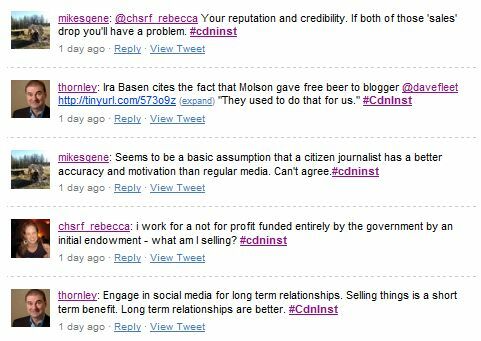 I’d like to think it’s because many PR people appreciate the fact that there is at least one journalist around who takes what they do seriously, who knows more about the history and theory of PR than most of them, and who wants to try to improve the often dysfunctional relationship between PR and the press. Or maybe it’s just because I’ll show up for free. I do try to tailor my remarks to be of interest to my specific audience. So no, I don’t have a set speech that I have memorized, and I’m not a snake oil salesman with a fancy slide show. Those people seem to thrive on the PR conference circuit. So perhaps my “entertainment” value is not up to your standards, but I guess you get what you pay for. Perhaps it is a legacy of my years at CBC Radio, but we tend to think audiences can rise to a challenge, and content is rather important. This is really all I have to say. I’m feeling better now. Have a nice day. Without doubt, your views and the way that you present them on air and in person spark discussion and tap emotions. One of the great things about social media is that we all have a platform to offer comments to the people who are interested in the same subjects as us. Prior to the advent of social media, this ability to broadly publish comments was limited to people like you – people with access to mainstream media. And all too often, that meant that you talked at us. If we were able to comment, our comments would invariably be edited to fit into the format of a Letters to the Editor section or “Your turn” on the television news. I think you make some good points. I only hope that you considered some of my points. This discussion is, in my mind, all good. And I’m happy to provide you with a public opportunity to respond to the comments I offered in public on Twitter and in the room. 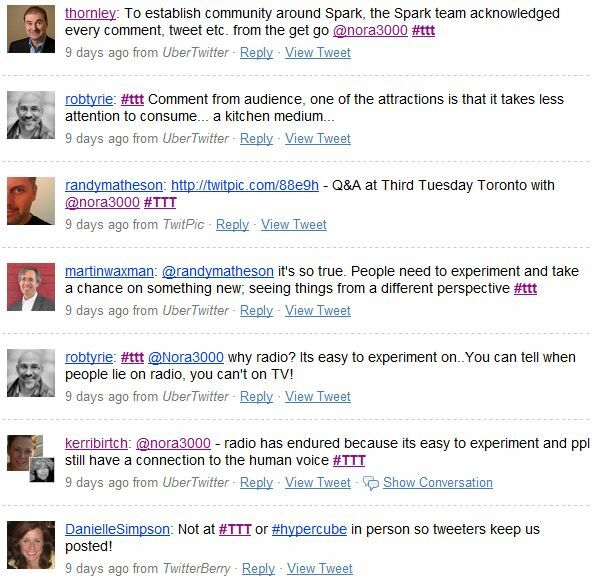 So, I’ll publish a post with my original Twitter stream and your email reply to me. If you’d like to provide me with the script you read in the room, I’ll publish that as well. I understand the point you are making, but I really don’t believe that what you were doing on Twitter could be considered a triumph of two-way conversation, or somehow analogous to how journalism works. For example, amongst the many unpleasant things you had to say about my speech, you accused me of tossing out “provocative things without quoting sources”. You’re obviously entitled to your opinion, but let’s pretend that you were giving a speech and I, as a reporter, was assigned to cover it. If I felt you were guilty of making comments that were unsourced, and by implication, untrue, journalistic convention would demand that I quote the offending statements, or at the very least, paraphrase them, before passing judgment on them. That’s not what happened here. You got to take a free swing. None of the people who read your comment would have any way of making an independent assessment of whether it was fair or accurate, since, like me, they have no idea what exactly you were talking about. And if I were a reporter covering your speech and I questioned the credibility of some of your statements, journalistic convention would also demand that I approach you and ask for further clarification before I write my story. Again, this isn’t what happened here. Your question to the room in no way reflected the tone or substance of your Twitter comments. If you thought my remarks were so off base, if you truly thought I had perpetrated an “odious caricature” of public relations, why didn’t you stand up and say so, instead of sitting back and telling the world what you were unwilling to say to the room? Here’s my point…. In my remarks on Wednesday I trotted out the old Spiderman adage that with great power comes great responsibility. In your note you wrote that “prior to the advent of social media, this ability to broadly publish comments was limited to people like you – people with access to mainstream media”. I agree with you, but I would add that in response to the power bestowed upon us by our monopolistic position, we adopted certain conventions, like the ones that I have referred to above, to try to ensure that we wielded that power responsibly. We also, I might add, tried to maintain a civil and respectful tone. I understand, of course, that we often came up well short of that ideal, but that’s not really the point here. Social media is supposed to be a two-way street, and fairness and balance is supposedly ensured by the self-correcting capacity of the web. But let’s look at this example. You took some shots at me that I consider to be unsubstantiated, inaccurate, and unfair. You were bound by no codes of conduct or ethics. I was only made aware of your comments because someone I know stumbled upon them. You have now offered me the opportunity to reply, and I appreciate that, but that was not your original intent. If it had been, you would have taken it upon yourself to initiate a dialogue on these issues that actually could have been quite useful to people in your business and mine. That would have been a genuine two way street. In the end, I think this whole incident confirms the original intent of my remarks on Wednesday. Social media holds out great promise, but for true believers to embrace a technology without thinking through the potential pitfalls as well as the promise does a disservice to everyone. As for Twitter, I think it is a wonderful tool for making dinner plans, but to think it can be a useful springboard for meaningful communications about important and difficult questions is, in my view, seriously misguided. Finally, I have no problem with you posting any of this wherever you choose, but my comments in my first note about [text deleted at Ira Basen’s request] is really nobody’s business, and probably unfair to the organizations involved, so I would prefer if you removed those references before posting. I will send you a copt of my original remarks later. Thank you. So what do you think? What are the real issues here? Where do you come down on them? 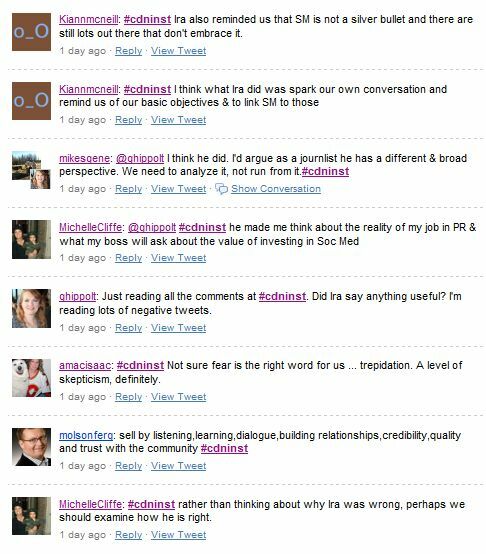 When I chair a social media conference, I like to introduce the participants to Twitter and Twitter search at the beginning of the conference so that they can experience community building and conversation during the conference. Question for you about the use of #tags that came out of the way you used them at the conference. We are a co-sponsor of a series of [events] that revolve around various science topics. After my presentation and your use of the tags someone from one of the other sponsor of the [events] finally ‘got it’ and has asked me to add some social media elements to the events. The next one is [next week]. I’d like to essentially Twitter the event, add some elements to our Facebook app and/or group and of course blog about it. The tag I’d use is #xxxxxxx. Now for the question… You can’t ‘reserve’ a tag and we’d like to do some pre-promotion through our e-mail lists and the co-sponsors’ web sites. If I start using the tag in the next few days to make sure it doesn’t become something else ( not likely but you never can tell ) is that considered okay Twitter Etiquette or do I simply wait until the day of the event and start building up to it ? However, to ensure that I’m not overlapping with a contemporaneous event, I’ll search for the term on search.twitter.com prior to beginning to use it. I count on others to do the same thing. So, if you start to use a hashtag now, others will discover in their search that you are using the hashtag and they will avoid using it while you are using it. Finally, some people argue that if you are using a term that is truly unique to you, there is no need to use a hashtag. 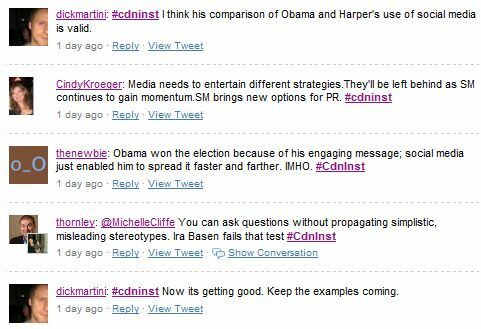 This was the case for an event like BlogOrlando, where the organizers decided to tweet without using hashtags. However, this works if you want to be discovered only in search.twitter.com. Your event will not be picked up in mircoblogging search services such as twemes. Hashtag etiquette relies on simple consideration. Use a tag that makes sense in the context of your event. Check before you begin to use it to ensure that no one else is using it. And feel free to start using it as soon as you will be generating enough tweets to make it a meaningful search term. Do you agree with my advice? Would you add to it?